The Union Minister for Women and Child Development, Smt. Maneka Sanjay Gandhi addressing a press conference, in New Delhi on November 08, 2017. The Secretary, Ministry of Women and Child Development, Shri Rakesh Srivastava is also seen. New Delhi: On the occasion of Anti Black Money Day being celebrated in the country today, the Minister of Women and Child Development Smt. 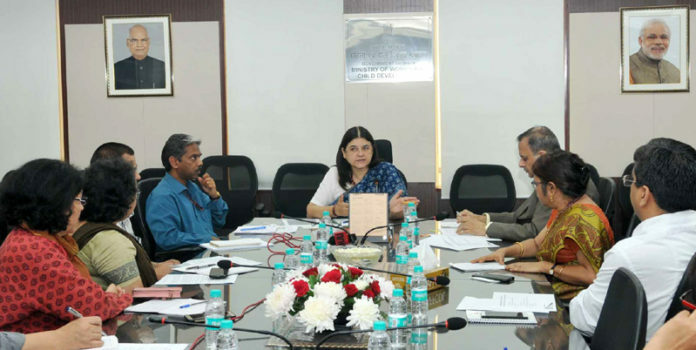 Maneka Sanjay Gandhi briefed the media about the initiatives taken by the WCD Ministry in promoting transparency, e-governance, preventing leakages in the system as well as eliminating areas of corruption. Addressing the media, Smt Maneka Gandhi said that the government is totally committed to bring transparency in the system since transparency is key to controlling corruption and black money. In pursuance of the same, the WCD Ministry has taken several steps in this direction, she explained. Smt. Maneka Gandhi stated that the WCD Ministry was the first Ministry to start procurement through the GEM Portal and today the entire procurement, from a pencil to a computer, is done through this portal. Even hiring of some of the services is being undertaken on this portal. This gets the Ministry the best possible rates with no element of corruption, the Minister explained. Giving more details, Smt Maneka Sanjay Gandhi said that the WCD Ministry works with a number of NGOs under various schemes. In order to streamline the process of receipt of proposals as well as disbursal of funds, the Ministry has created an NGO portal and each and every NGO has to apply only through this portal. This portal is also linked to the Darpan portal of Niti Aayog. 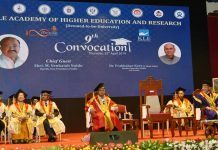 The Minister also highlighted the steps taken under Direct Benefit Transfer (DBT) Scheme. The Ministry is currently operating 14 different schemes where funds/ services are given to individuals as well as institutional beneficiaries. All the schemes have been put under the DBT System which is Aadhar seeded. This is one of the largest DBT systems of the Government of India today, Smt Maneka Gandhi disclosed. The Ministry was also the first to get on board the Public Finances Management System completely. This not only enables all funds to be transferred directly to the target bank accounts but also monitor the utilization of these funds centrally. Launch of CARINGS website under CARA has completely automated the adoption process. Now all legally free children and parents wanting to adopt them are in a single database and the matching is done by the system itself. The WCD Minister said that all the erstwhile malpractices and middlemen have been eliminated by this path breaking measure. The system of feeding the children under the anganwadi system was an area ridden with leakages and siphoning. The Ministry has inducted massive use of technology for real time monitoring so that these leakages can be removed. As a first step, 50,000 anganwadis have been enabled to use smart phones for Aadhar based registration, daily attendance, record of feeding, record of health etc. The system generates alerts for non-attendance and malnutrition. This has not only eliminated ghost beneficiaries but also removed the corrupt practices. This is a revolutionary step, the WCD Minister added. Smt Maneka Gandhi also gave details of other important measures taken to promote transparency and improve management of finances like implementation of e-office in the WCD Ministry, 87% recovery of loans of Rashtriya Mahila Kosh, having a strong grievances redressal mechanism, physical check of Child Care Institutions among others. Later, Smt Maneka Sanjay Gandhi also briefed select journalists of her constituency, Pilibhit about the all round short term and long term benefits of De-Monetization.